Audie fancies herself a rebellious genius. She and her friends play the system by volunteering for drug trials, for which they receive reimbursement, of course. They lie about their ages, medical histories, what other medication they might be taking, you name it. Whatever it takes to get that cash in their hand. Sometimes they’re caught, some of them even permanently black marked from participating in future trials, but not Audie. She treats this like a job, a science even, calculating exactly what she can get away with and what her body can take. Then Audie’s friend has a crazy idea. Rather than a trial here, a trial there, a slow pace to stay under the radar, why not push full speed for a short time and really cash out? Sign up for as many, or more, trials than any human body could possibly handle and collect as many payments as possible before getting caught. At first, Audie thinks, “No way,” but then she considers her boyfriend Dylan, the one bright light in her dark, dim, lonely life. Audie’s a mess really and she knows it, but Dyaln’s a good boy, someone with a more normal life, family, and home. Someone who’s sweet and considerate and much more wholesome than any of her friends. And, in a twist Audie finds standard for her life, her wonderful boyfriend Dylan is dying. They met because she’s always around hospitals searching for a score while he’s always around hospitals, well, you get the idea. It occurs to Audie that if she goes along with her friend’s one-last-big-payout idea, she could afford to do something incredibly memorable for Dylan’s birthday, maybe take him on a trip. And that’s how Audie finds herself tripping down a path of terrible decisions. Let me mention right now that this isn’t the book you think it is. Trust the author. Things that don’t make sense now will make sense later. I had a lot of doubts and questions undermining the story for me at first until the pieces filled in enough for me to see the big picture. It’s an emotional wham! when it hits you, what’s really going on. 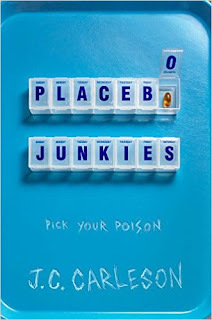 Audie isn’t a reliable narrator with how many drugs she’s taking and as the story progresses, you’ll figure out where her version of the truth isn’t the actual truth. 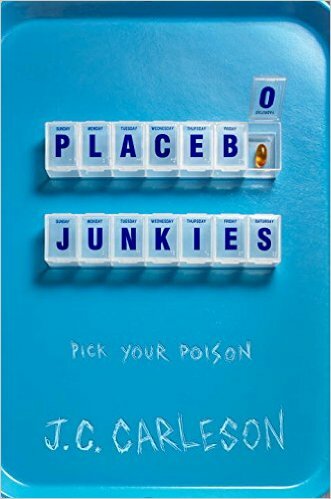 PLACEBO JUNKIES is a skilled mind-trip that made me want to immediately re-read the book the moment after finishing it so I could catch every twist and nuance that would have been lost on me in the first read. Sounds amazing! I'll have to add this one to my list.